The installation of TEKLYNX CENTRAL failed with a message “Unable to connect to UMSS server. It is not available”. This article explains the problem and offers a solution to this issue. During the installation process of TEKLYNX CENTRAL, the installation displays an error message window with the message “Unable to connect to UMSS server. It is not available” and the installation of the software failed. The error occurred because UMSS Service TkxSvr Servers Service did not start. 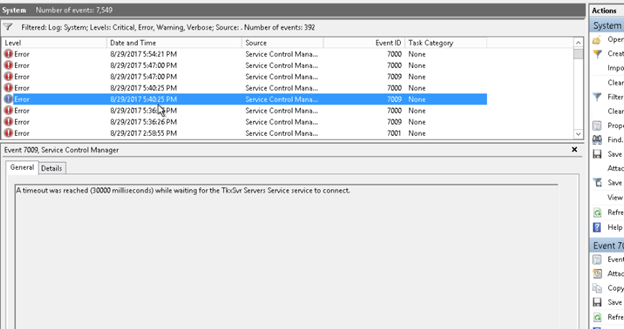 When checking the error events in the Windows Event Viewer, there should be entries with event # 7009 during the time of the software installation. The event will point to the fact that the service TkxSvr Servers Service did not start because the “timeout was reached (30000 milliseconds) …”. In short, the service took too long to start. There can be many possible causes for this; server configuration or no access to Internet to name two. Since this is a timeout issue, we can resolve this situation by increasing the timeout value from 30000 milliseconds (30 seconds) to 60000 or 120000 (1 minute or 2 minutes).